Ok, I’m back to breakfast for today! One of the things my family loves to eat for breakfast is granola. It’s a comparable sensory-experience to cereal (some people just need that crunch and cold milk in the morning… meaning: my hubby! 🙂 ), but of course far far outweighs the nutritional value of any boxed cereal, no matter how “natural” the label says it is. It is also much more filling than toast, or other simple carb breakfast, or even plain oatmeal. Here is my granola recipe, once again a blend of different recipes I have made over the years. My Little M and I both do well with Bob’s Red Mill Gluten-Free Oats, so that is what I use. 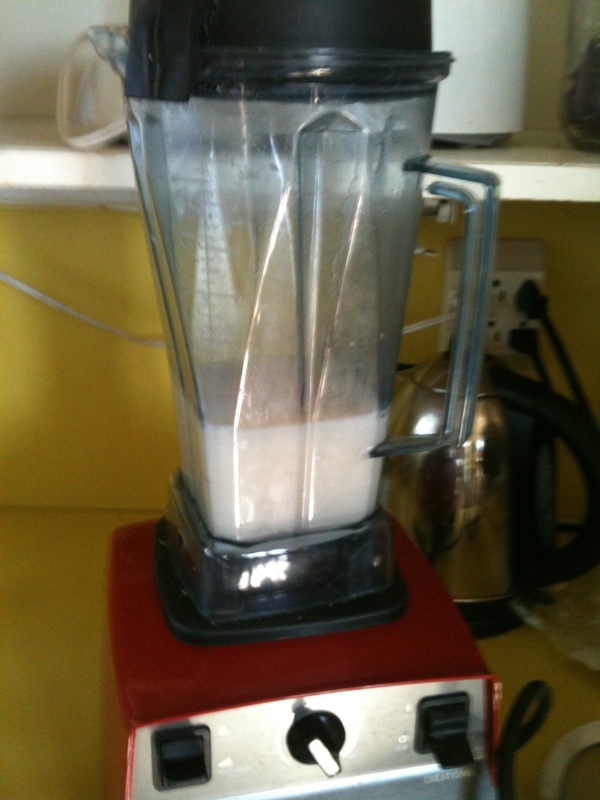 I grind the almonds and sunflower seeds (one cup at a time) in my food processor, not until they are a flour, but until they are well broken up, like into a “meal”. I put all the dry ingredients into my kitchen-aid bowl, and mix, then add the honey. (I often mix the honey in a little more by hand, while putting into onto the baking sheet.) 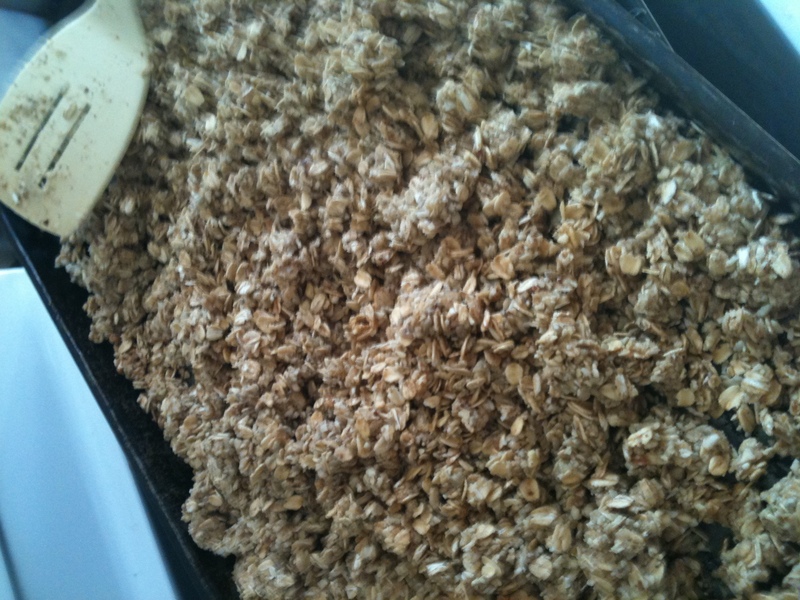 I lightly oil my baking sheet with light olive oil, and then spread the granola evenly on the pan. I bake at 250 for 20 minutes, stir, and then do another 15-20 minutes in the oven, depending on how chewy vs crunchy you like your oatmeal. We prefer ours on the chewy side. Cool, and then store in an air-tight container. Because not everyone hear love raisins, we add them separately to our bowls, but you could add them when putting the granola into your container. I sometimes add in vanilla when mixing, and sometimes I’ve added pumpkin seeds. We have been using rice milk for YEARS in our family, long before we went gluten-free. (Incidentally, after removing gluten, corn and soy from my diet, my intolerance to dairy just about disappeared! Two of my family are still highly intolerant however at this point). Our favorite rice milk is Rice Dream. I put these ingredients into my Vitamix, and pulverize it for about 2-3 minutes. Then I pour it through a fine strainer into my measuring cup. Then I pour it into a glass bottle or jar and keep in the fridge. It does separate some, but so does the store-bought stuff, just a little more so. I have also made almond milk, use a few tbs of almonds for 1 cup of filtered water, and used this in baking and smoothies, as well. That might be my favorite! 🙂 When we cook up a batch of rice for a meal, I will put half-cup portions into freezer bags, and freeze them. 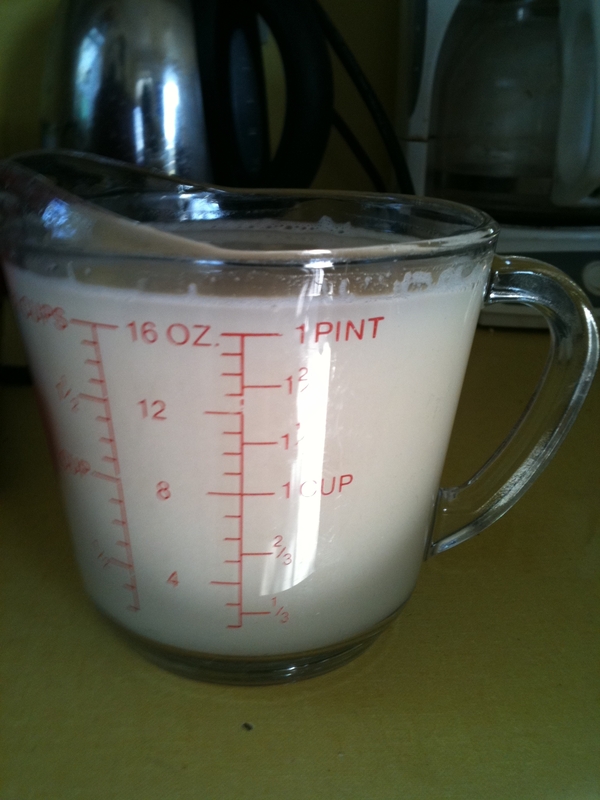 Then, when I need rice milk, I can pull out one bag, and have the right amount of rice. One more breakfast recipe for Day 10: Breakfast Cookies! !